As we enter the beginning of the holiday season, we would like to take a moment to say “thank you.” It is with your support that provides us the ability to accomplish our monthly activities, leading to increased road safety awareness and safer road users. This year, AIP Foundation is part of a call to action that will celebrate a day dedicated to giving. On Tuesday, December 2, 2014, AIP Foundation will join the global movement #GivingTuesday by encouraging our supporters to give a helmet to a child in Vietnam. We invite you to join the giving movement here. To read more about our activities throughout the month of October, please see below. This month, AIP Foundation's CEO Mirjam Sidik and International Partnership Director Linh Nguyen attended the 20th meeting of the UN Road Safety Collaboration, whose members are committed to road safety efforts. 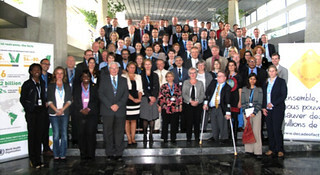 The Collaboration facilitates international cooperation and works to strengthen global and regional coordination among UN agencies and other partners to implement UN General Assembly Resolutions and recommendations of the WHO’s World Report on road traffic injury prevention. Read more about the UNRSC here. In 2010, AIP Foundation made a commitment with the Clinton Global Initiative to reduce road traffic fatalities and serious injuries by promoting safer behavior among road users and increasing access to high-quality helmets in developing countries. 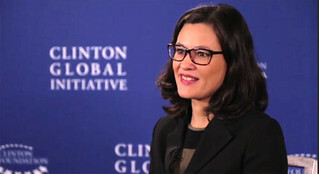 At the Clinton Global Initiative 2014 Annual Meeting in New York City last month, CEO Mirjam Sidik spoke on the progress that has been made with regard to this commitment. Watch the full commitment video here. Map: Where is the world's most dangerous place to drive? According to the World Health Organization (WHO), over 1.24 million people die every year due to road crashes, but rates vary significantly between countries. 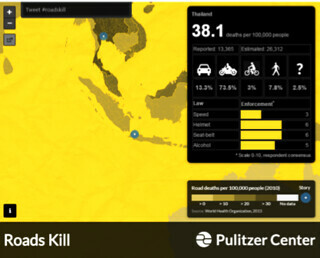 Roads Kill, an interactive map created by the Pulitzer Center, maps out countries based on their road crash fatality rates. The map shows, road-traffic deaths are a huge problem in developing nations. They are also the leading cause of death globally for people between the ages of 10-24 and the world's ninth leading cause of death overall. In the nine months leading up to October, there were 18,697 traffic accidents throughout the country resulting in 6,758 deaths and 17,835 serious injuries, according to the National Traffic Safety Committee. The total number of accidents, fatalities, and injuries were down from the 2013 levels. 10 provinces and cities experienced declines in all three criteria; however, 9 localities registered an increase of fatalities (up 25% against last year’s same period). Minister of Transport and NTSC Vice President Dinh La Thang said with the imposition of tougher measures, the number of traffic accidents during the Lunar New Year and holidays were reduced. He urged relevant agencies to continue to raise public awareness of traffic safety and improve infrastructure to prevent traffic accidents. Source: Source: Vietnam Today, 3 October, 2014. 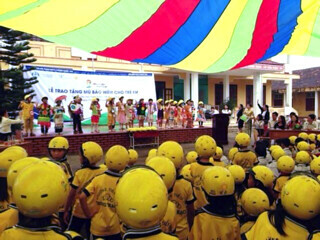 With financial support from Johnson & Johnson, 5,093 helmets were distributed to 39 primary schools in the provinces of Ha Tinh, Quang Binh, and Dong Nai this month. Helmet donation ceremonies were held under AIP Foundation’s Helmets for Kids program and organized by the National Traffic Safety Committee (NTSC), Ministry of Education and Training (MoET), and provincial and district counterparts with the goal of increasing child helmet use. In addition to donating helmets to new students and replacing crash helmets at no cost, 228 subsidized helmets have been contributed by parents replacing cases of lost or overgrown helmets to ensure that children are fully protected. This parental contribution shows the positive awareness and behavior changes of students’ parents. In October, Vice Chairman Dr. Khuat Viet Hung of the National Traffic Safety Committee (NTSC) visited AIP Foundation’s Ho Chi Minh City office to meet the team and express his support and enthusiasm for increasing child helmet use and pedestrian safety across Vietnam. Currently, AIP Foundation is collaborating with the NTSC on a National Action Plan to increase the helmet wearing rates among children. Mr. Vice Chairman discussed AIP Foundation’s involvement with the National Action Plan on Child Helmet Use and expressed his appreciation of our efforts. AIP Foundation has partnered with the NTSC on multiple mass-media campaigns and programs focusing on road safety, including child helmet use, through Helmets for Kids. To support the enforcement of the Cambodian draft traffic law, this month AIP Foundation coordinated meetings between Cambodian and Vietnamese senior government officials in Hanoi. Officials discussed and shared experiences on road safety management, quality helmet standards, and helmet use enforcement. Cambodian officials visited AIP Foundation’s Protec Tropical Helmet Factory and testing laboratory in Hanoi as well as the Vietnamese government helmet testing center. 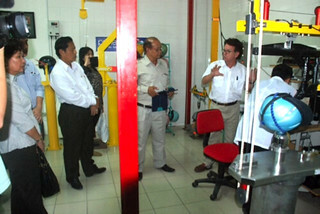 One objective for Cambodian officials was to learn about the establishment and maintenance of helmet testing centers in Vietnam in order to determine the feasibility of building a similar facility in Cambodia. The Cambodian draft traffic law, which would mandate helmet wearing for all motorcycle passengers, is expected to be enacted in 2015. A helmet laboratory in Cambodia would be imperative to help curtail the low-quality helmet use within the country. On October 30, FedEx and Safe Kids Vietnam-AIP Foundation supported International Walk to School Month by holding a Safety Walk for students at Phuoc Binh Primary School in District 9 of Ho Chi Minh City. The event is part of Safe Kids Walk This Way, a road safety advocacy program with the goal of increasing awareness about pedestrian welfare. 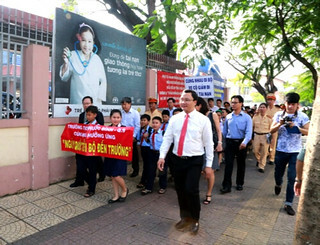 Government officials from the National Traffic Safety Committee, Ministry of Education and Training, Ho Chi Minh City People’s Committee, and other Ho Chi Minh City authorities; Goodwill Ambassador and Singer Ngo Kien Huy; senior representatives from FedEx and AIP Foundation; parents; and volunteers joined the students and school administrators for the Safety Walk to promote safe walking practices that aim to reduce traffic crashes involving pedestrians. The program puts a special focus on children for whom traffic crashes are a leading cause of injury and death. This year’s WTW programs will include a photojournalism project that will encourage 11,893 students from 12 secondary schools to capture images of safe or dangerous road user behaviors and environments; a series of road user workshops that will bring pedestrian safety education and equipment to 20,145 students in 18 primary schools throughout District 9 in Ho Chi Minh City; and target schools in District 9 will undergo structural changes to improve the pedestrian environment for students. For more information and photos of the event click here. Opinion Piece: Improving road safety in Cambodia—When I sit in Phnom Penh’s traffic, I watch with astonishment as motorbikes (motos), tuk-tuks, bicycles, and pedestrians compete for space on the road with cars and trucks. Cambodians are very resourceful at navigating through traffic, but that has not stopped the country’s number of fatal road accidents from rapidly rising over the past decade. Each year, traffic accidents in Cambodia kill nine times more people than malaria, dengue fever, HIV/AIDS, and landmines combined. As the volume of traffic continues to increase, many people recognize an urgent need to improve road safety and strengthen the traffic management system to support Cambodia’s economic growth. Keeping in mind the tragic statistics that I mentioned above, road safety must be an important consideration when managing a transportation system. Many traffic deaths can be prevented by improving road design and raising safety awareness. For example, the simple practice of wearing helmets can save the lives of many moto drivers and passengers, who account for three-quarters of all the traffic deaths in Cambodia. To help put a stop to such unnecessary road crash injuries and fatalities, the U.S. government is implementing a two-year program on helmet safety with the Asia Injury Prevention Foundation. It's 4pm on a Saturday afternoon, and the women of the Generation shoe factory are finally free. After a long day at work, they are happy to cast off the drudgery of the assembly line and finally do as they please. But soon, after this brief respite, they will gather their purchases and set off for what is by far the most dangerous part of their working day: the drive home. 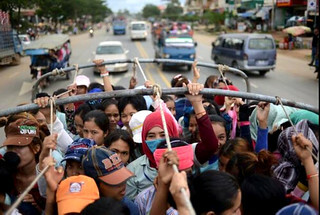 Although oppressive conditions in Cambodian factories have become a major issue here over the past few years - with dozens of unions fighting to raise the meagre minimum wage in the face of long hours, forced overtime and bare-bones safety standards - the daily commute is still the most dangerous part of working in a Cambodian garment factory. To get to and from work, much of the industry's largely female workforce must pack themselves shoulder-to-shoulder into flatbed trucks, where they stand and cling to overhead poles or even ropes for balance while being driven long distances across the countryside by untrained drivers. 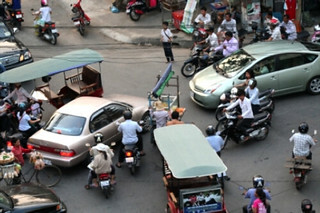 Even in the safest cars, Cambodia's fledgling highway system is a dangerous place. As in many developing countries, the quality of the roads here has improved dramatically over the past decade. But driving skills, law enforcement, and vehicle inspection are still dismal. Source: Aljazeera, 4 October, 2014. This month, teachers from multiple program schools worked with AIP Foundation in order to prepare for upcoming helmet donations and road safety education in classrooms. Under the Helmets for Families program sponsored by Manulife (Cambodia) Plc., 30 primary school teachers were trained this month as well as 362 teachers under the USAID-DIV supported “Head Safe. Helmet on.” project. 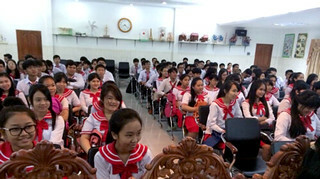 Educators and AIP Foundation discussed Cambodian road crash statistics and proper helmet use techniques. Teachers shared personal experiences about road crashes and explored solutions that will encourage students to wear helmets while commuting to and from school. In addition, teachers completed “train-the-trainer” sessions on helmet use and road safety. Throughout the year, teachers will implement a series of reinforcing activities with other staff and students. AIP Foundation looks forward to seeing the innovative techniques employed by teachers to further disseminate helmet use and road safety information. To foster additional support for the motorcycle passenger helmet law, AIP Foundation visited Habitat for Humanity Cambodia (HFHC), American Intercon School (AIS), and Westline School to present on the importance of the law’s enactment. AIP Foundation encouraged each audience to pledge their support on the campaign website, saferoads.org.kh in order to generate more awareness. Additionally, volunteers visited local coffee shops, supermarkets, and gas stations to further rally the community and inform them of the law. Pledge your support for the swift enactment of the passenger helmet law here. This month, the Ninth Commission of National Assembly held a Parliamentary Consultative Workshop on the “Law on Road Traffic” at the National Assembly in Phnom Penh. 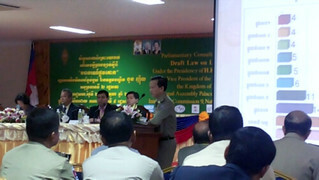 Cambodia Country Director of AIP Foundation Mr. Kim Pagna presented an analysis study on “Cost and Life Savings Analysis if the Passenger Helmet Law is passed and enforced by 2014.” The plenary session of the workshop was attended by up to 200 participants, including Members of Parliament, Senate, government and civil society representatives, and youth group affiliates. The workshop discussed the draft road traffic law, which includes an amendment that would see motorbike passengers, including children, mandated to wear helmets. Mr. Kim Pagna commented on his appreciation for the government’s efforts for its recent approval of the draft traffic law, currently waiting for approval by the National Assembly, and encouraged the legislative bodies for its swift passage into law. This month, a delegation led by Greig Craft, President of AIP Foundation, met with several senior legislative members and development partners in Cambodia to introduce the USAID Development Innovation Ventures (DIV) funded project, “Head Safe. Helmet On.” The meeting aimed to advocate and share scientific evidence for the swift passage of the draft Road Traffic Law, in which motorcycle passengers including children are mandated to wear helmets. 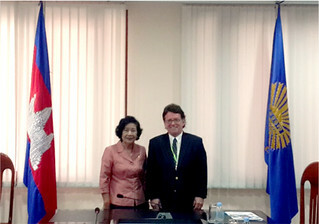 Officials included the Heads of commissions of both the National Assembly and Senate who are responsible for Public Works, Transports, Telecommunication, Post, Industry, Mine, Energy, Commerce, Land Management, Urban Planning, and Construction; Senior Infrastructure Specialist of the World Bank; Cambodia Resident Mission; and Senior Project Officer of the Asian Development bank. At the moment, legislative approval is still needed by the National Assembly and Senate for the passage of the Road Traffic Law, and according to the meetings, it is expected that the final discussion and approval process to pass the draft Law will take place soon. AIP Foundation is strongly encouraged to see advocacy efforts leading towards change, and are excited that the “Head Safe. Helmet On.” project is being implemented at such a crucial time in Cambodia. AIP Foundation was warmly welcomed by those officials, in particular from the legislative bodies and received firm support for the implementation of the “Head Safe. Helmet On.” project. Moreover, AIP Foundation was recommended to further contribute to address the current acute road traffic crashes in Cambodia and increase the use of standard helmets.